There was a sequel to Lesley Gore's 'It's My Party'. 'Crazy Little Thing Called Love' and most of the bassline to 'Piano Man'. Peter Noone of Herman's Hermits has a net worth of $3 Million! If you play bass, I'd recommend trying out Please Do Not Go by Violent Femmes. I learned it myself today, and it's very satisfying to play. I play bass when I can get my hands on it -- usually in a band setting when the regular bassist plays piano and I fulfill the bass duties. Thing I learnt today: Wombats produce square feces so that they can pile them up in prominent places as markers to communicate with other wombats. Now how on earth did you learn that? My sister randomly asked me, 'What's a wombat?' 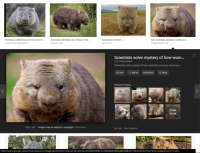 probably from some book she was reading, and so I googled 'wombat' so I could show her images, and this was in the results. Alaska has a higher recorded temperature than Hawaii. I don't think I've done this before, but I've learned more about an old entry. In the early nineteenth century, ketchup was sold as medicine. Ketchup was sold as medicine in the 1830's as a treatment for diarrhea. Fake news of the 1830's!!! There's a few, very few people I know that I now have a word I can use to describe them........ agelastic .....Unlikely to cheer them up much. ^ I knew someone like that. She passed it on to her kids. Her husband was a Vietnam veteran with really bad PTSD. I don't think he could stand any noise hardly at all. So the lady had to keep her kids quiet all the time.